Located just six miles west of Westminster, New Windsor is a Maryland town with a history dating back to 1797. Today, more than 1,390 people call the town home and it has been the headquarters for the Church of the Brethren for more than 50 years. Homes here are steeped in history, and as such many homes date back some time. But whether you are living in a newer home or an older one, there are certain things that remain the same. One perfect example of this is the need for basement waterproofing. New Windsor homes often need this basic step in order to protect their structural integrity, safety, and value. With the heavy rains that summers in Maryland often receive, and with the heavy snows and consistent 20 degree days in the winter that bring heavy freezing, our homes here can face a tremendous number of weather related challenges. Combine those points with the spring thaw, when even more moisture is seeping through the ground, and it becomes clear that taking steps to protect your home is something you can’t afford to ignore. And basement waterproofing New Windsor homes is the key to doing just that. At first glance, basement waterproofing New Windsor homes can seem like an expense you can simply ignore. But the reality is that it’s something you need to give serious attention to. There are numerous reasons for this, and when you look at what waterproofing provides to you it’s easy to see that it is an investment in your future, not an expense. • First, it protects you against more expensive repairs in the future. The reality is that basement waterproofing New Windsor homes is much cheaper than things like foundation repair, mold remediation, and replacing framing lost to rot. In short, you will save yourself money in the long run by investing in waterproofing. • You are also able to keep yourself and your family safer. Mold growth can lead to respiratory health issues and other illnesses. 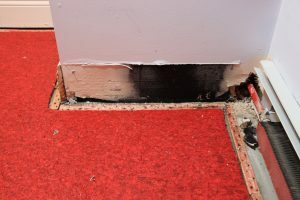 When you waterproof your home, you prevent this from becoming a problem at all. • Personal belongings stored in a damp basement can quickly become damaged due to the increased moisture levels. Basement waterproofing New Windsor homes lets you keep your belongings safe. • Waterproofing also helps you increase the overall value of your home and protect its liquidity. Appraisers and home inspectors will factor in things like water damage when determining a home’s value, and waterproofing protects your investment in a big way. • All of these points add up to a bigger one – peace of mind. Knowing that your home is protected and that your investment is safe is absolutely vital for any homeowner. Waterproofing gives you that peace of mind. As you can see, there are numerous reasons that you need to consider basement waterproofing New Windsor homes. By taking the steps to do so, you’re protecting your family and your home for the future. Knowing that waterproofing is important is the first step, but the second is figuring out whether or not your home needs waterproofing services. As a general rule of thumb, those who haven’t had their home waterproofed in the past or who are unsure of when it was waterproofed should let our team take a look and see if a problem exists. • Obvious moisture in the basement or crawlspace. Things like puddles or wet spots on walls are key signs that a major leak is occurring. • Dark spots on the walls or floor are also signs that moisture is finding its way through the walls and into the basement. • Mold growth is a sign that moisture is already present and having a major impact on your home’s overall health and safety. • Damp, musty smells can also be indicators that a leaking basement is an issue for you. Any of these signs mean that you need to contact someone to see what your problems are and how we can help. Our team can provide you with the waterproofing services needed to correct an issue and get your home back in top shape.